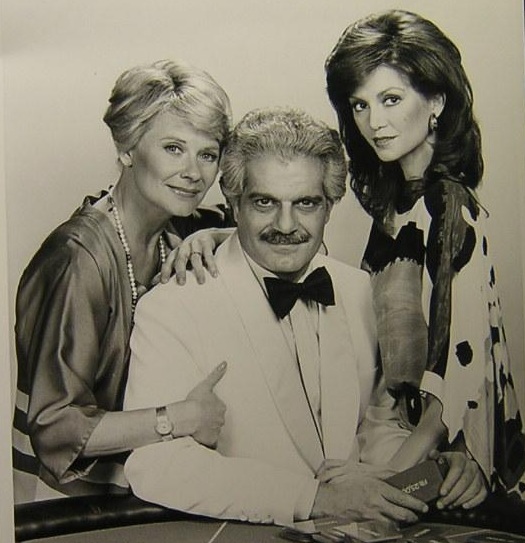 Pleasure Palace–be careful Googling that title or you might stumble upon some naughty films–is a 1980 TV film starring Omar Sharif, Hope Lange, and Dallas vixen Victoria Principal. 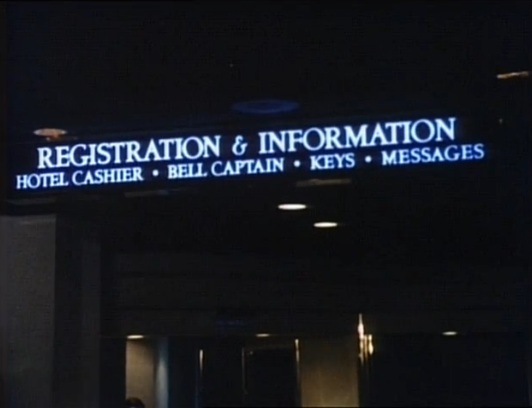 On a side note, I’m pretty sure the font used in the title and credits is the same font used in the 1985 Alice in Wonderland miniseries (in other words, a very standard 70s/80s media font). 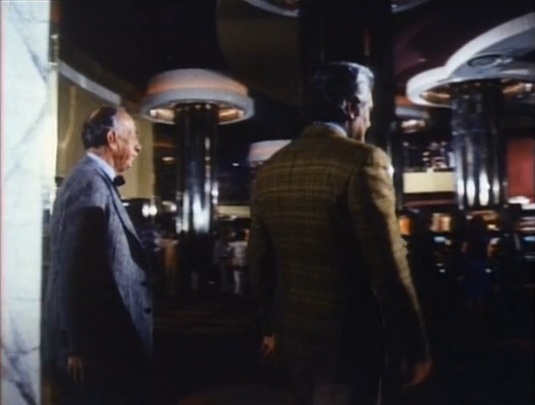 Much like Where It’s At, the 1969 feature film I screen capped awhile back (you can view that blog of pics *here*), Pleasure Palace had the privilege of filming carte blanche inside Caesars and was free publicity for the casino. Ironically, the same thing could be said of the movies Rain Man and The Hangover, and I’ve never seen either one of those. 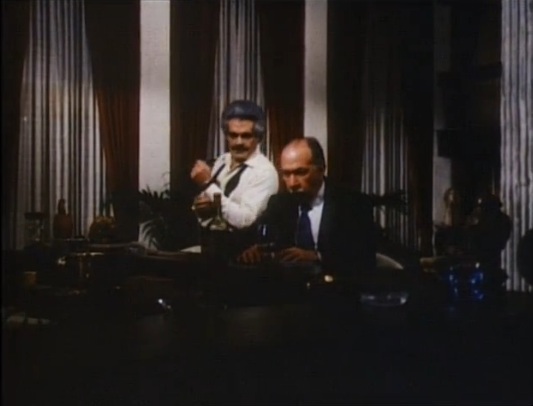 Who knows, perhaps I’ll be screen capping those for nostalgia’s sake in ten or twenty years! 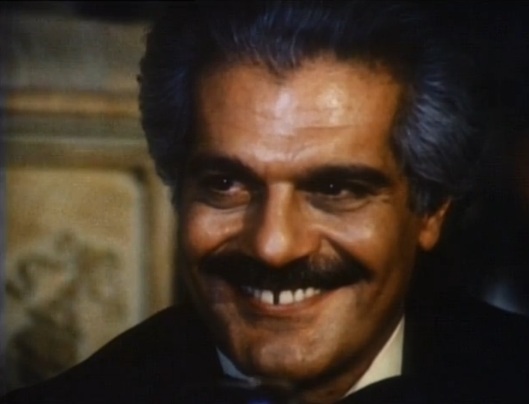 The plot of Pleasure Palace is embarrassingly convoluted; I read somewhere that poor Omar Sharif took the part of the globe-trekking gambler character solely to pad his pockets for his own real-life, globe-trekking, gambling habit. 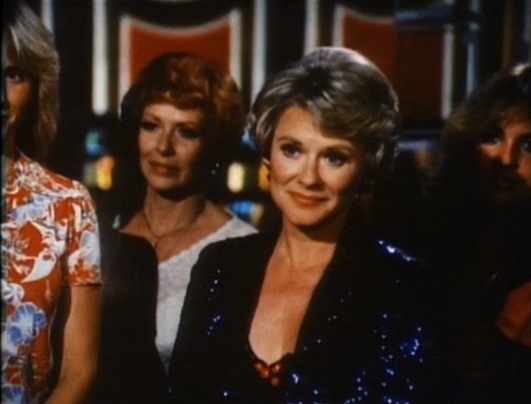 It was also an easy paycheck for Emmy winner Lange and primetime soap superstar Principal, so far be it from me to have qualms with the lame plot when so much vintage footage of Caesars from the year I was born exists because of this film. 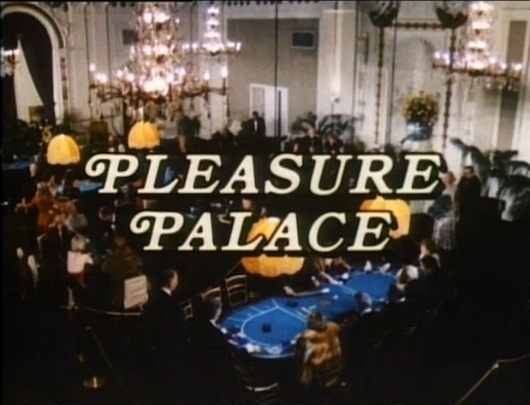 Without further ado, let’s enter the Pleasure Palace. The Appian Way rotunda inside Caesars…this looks remarkably the same, even with the opening of the adjacent Nobu hotel/restaurant just this month. 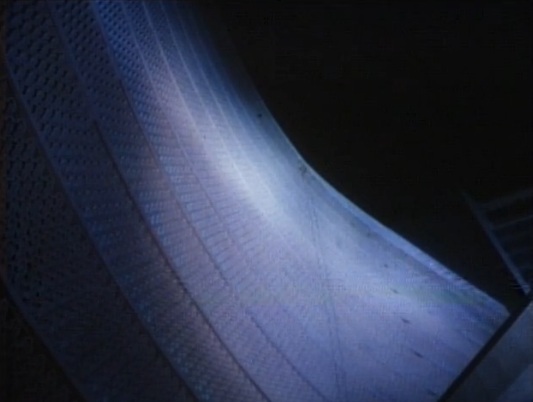 Here’s Victoria (AKA her stunt double) climbing down the facade. 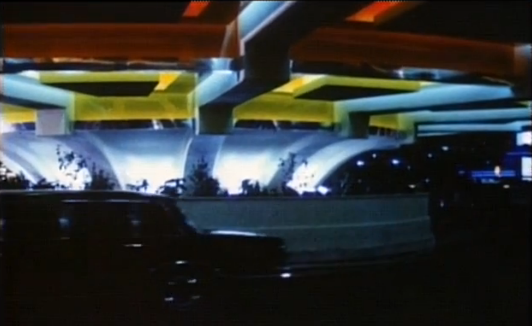 The North entrance porte cochere at Caesars–I’d never seen this before, and it’s long been demolished due to the resort’s expansion over the years. 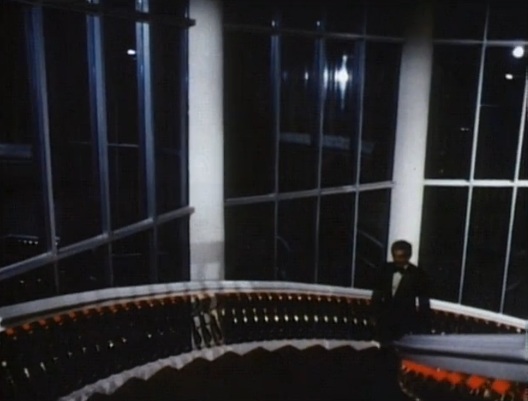 I’m curious about this balcony overlooking the casino. Love the way the columns are inverted at the top. 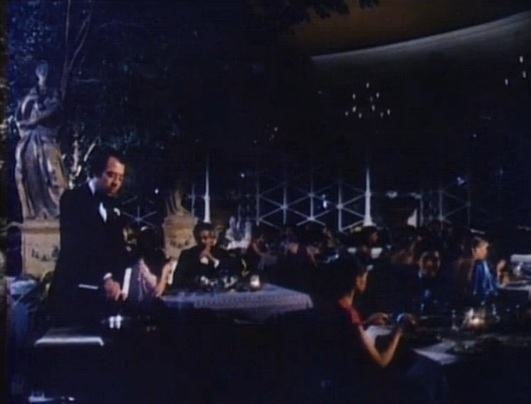 Notice the cocktail waitress on the left. They still wear a variation of this costume! 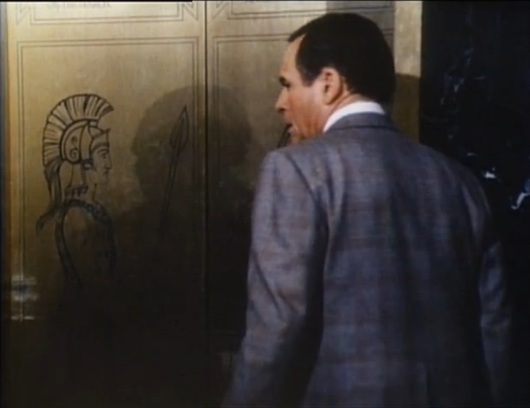 These elevator doors to the Roman Tower are exactly the same 33 years later! Sharif’s character was put up in one of the Fantasy Tower suites, which are in the present day Forum Tower. Look at that wall treatment. Look at that bar. 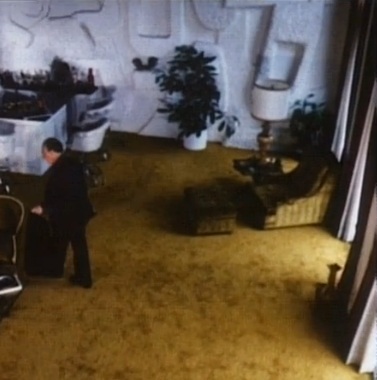 Look at that carpet! Sharif asleep in the Fantasy Tower suite bedroom. 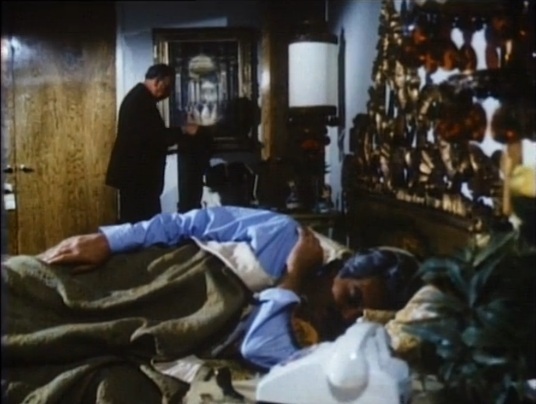 Notice the headboard. 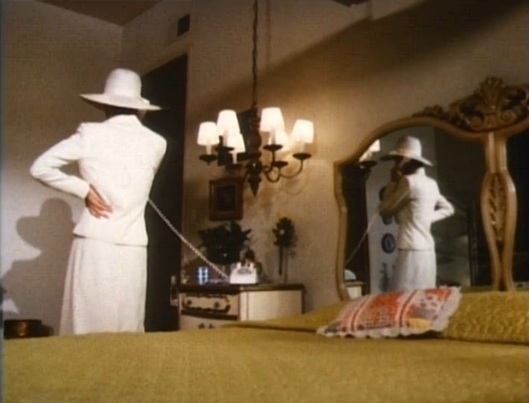 Possibly my favourite shot of the movie…Lange and her fur-covered bed and headboard. Wow, just wow. 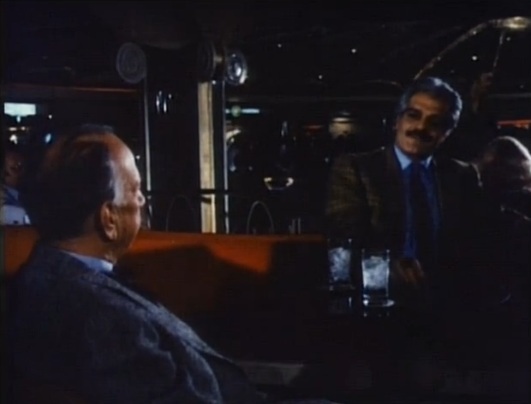 The guys having a drink in the Galleria Bar off the pit, both of which still exist and look remarkably similar. A random hallway shot. 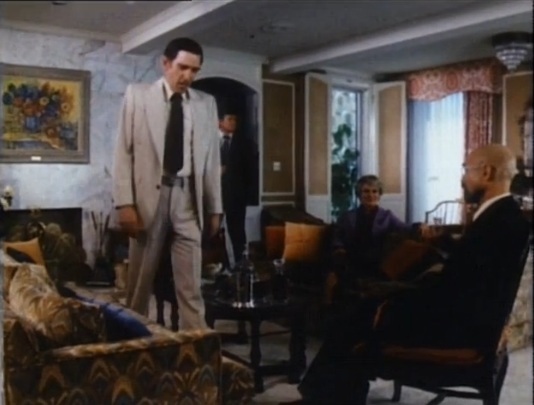 Again with that ridic carpet. A shot of Imperial Palace and the Flamingo from the penthouse. 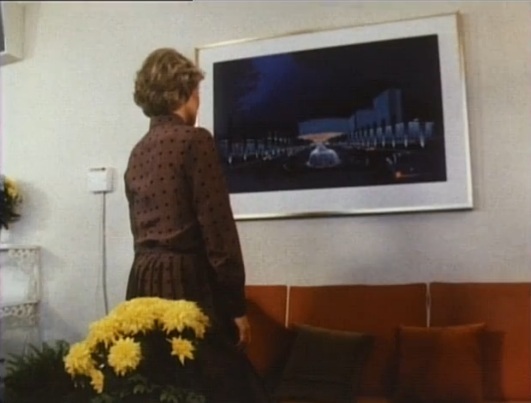 Again, these look remarkably the same 33 years later. 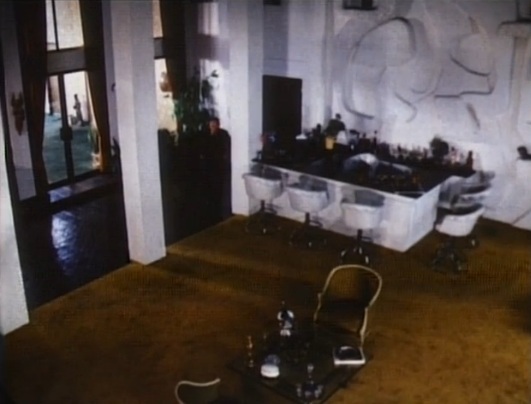 The “luxurious health spa”…so funny how now this looks like an outdated high school locker room. Sharif and the charming(?) gap in his teef. Did he always have this, even in his ‘Dr. Zhivago’ days? Not a noteworthy shot, except for the Omnimax Theatre directional sign behind Sharif. The Omnimax went bye-bye in the 90s, I believe. Nice window detail of the two-story Palace Court, as seen from the pool area. 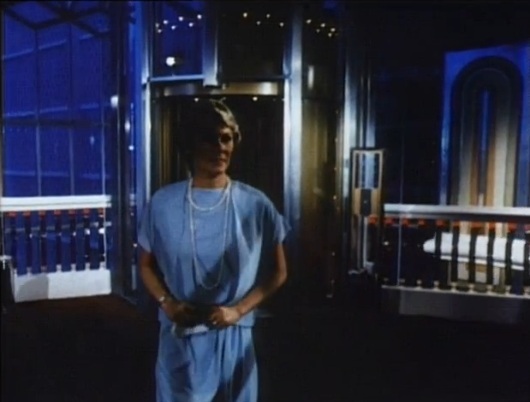 Hope Lange gets off the Palace Court elevator. 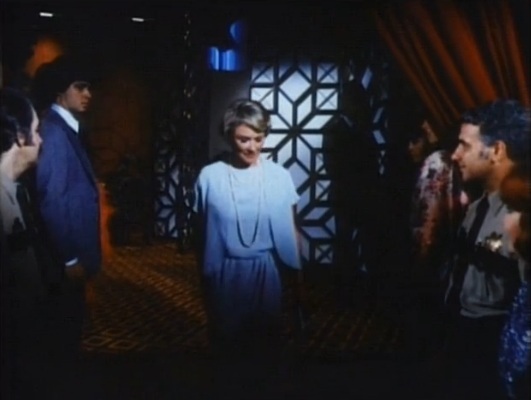 This is her in the foyer outside the high limits lounge after getting off the elevator. No clue what this second story area is now or if it even still exists. 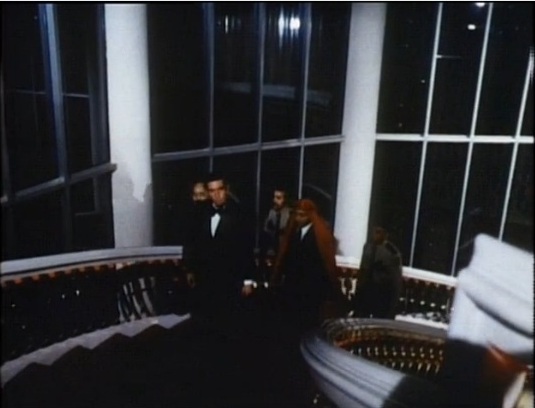 Another shot of that grand staircase…gorgeous. 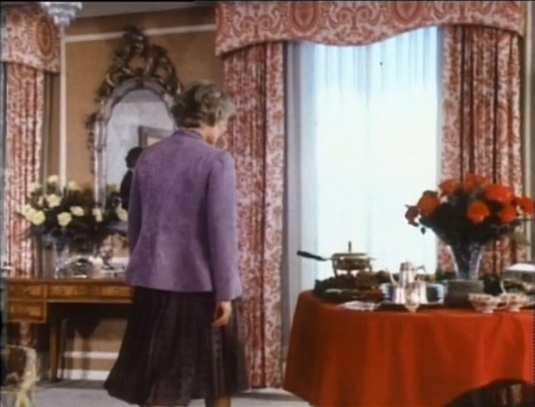 This was the Palace Court restaurant, or at least that’s what it was called in the film. Principal and Sharif dine in Palace Court. 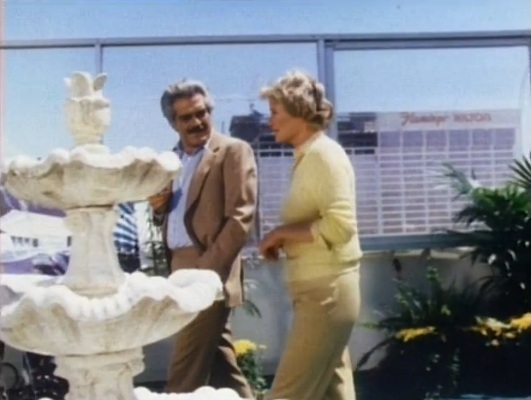 Lange and Sharif toast champagne in the penthouse, which Lange’s character–the owner of Caesars–lived in. This penthouse is on the rooftop of the Nobu hotel tower (formerly the Centurion Tower). 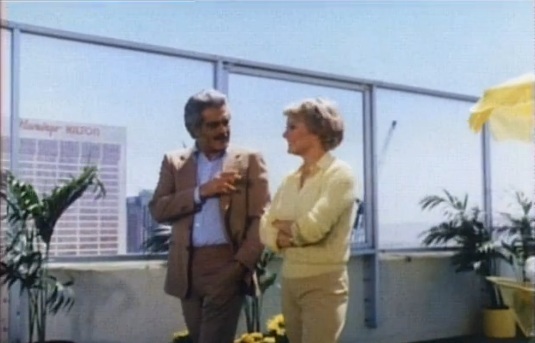 The last I was able to tell, the penthouse and its large patio had been gutted. 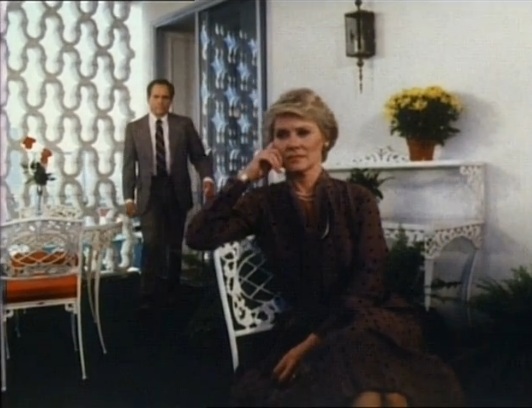 Kinda hokey, but there was lots of Caesars artwork in the penthouse since Lange’s character was the owner and lived in the penthouse. 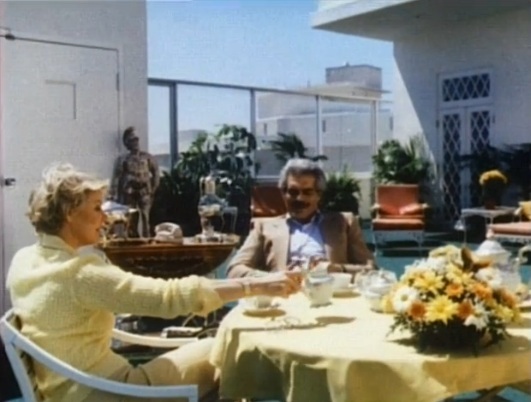 Breakfast on the penthouse patio. This space is viewable from the top floor of the Forum Tower and looks remarkably the same, minus a few cosmetic changes. Lots of original Caesars stone facade! All this is long gone. 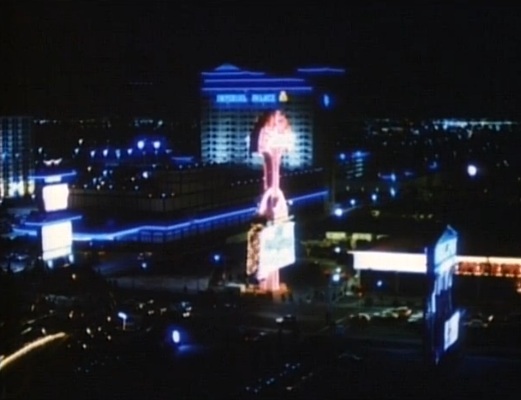 That’s the MGM Grand (now Bally’s) in the background. 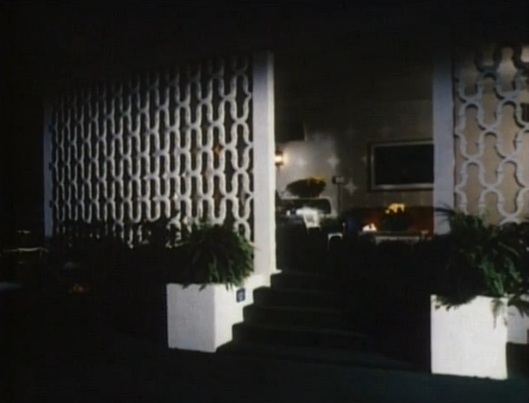 The penthouse patio at night…so swanky in its 60s/70s glory. 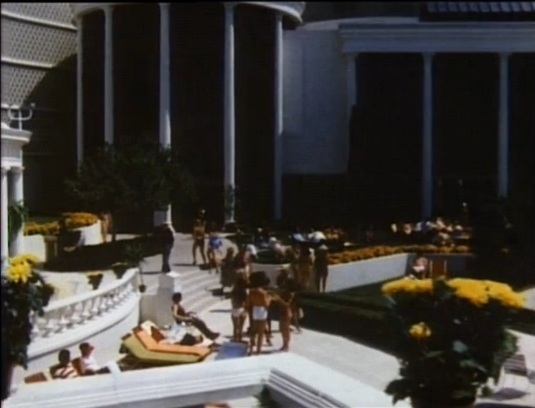 The huge hot tub at Caesars–I’d never seen this before! 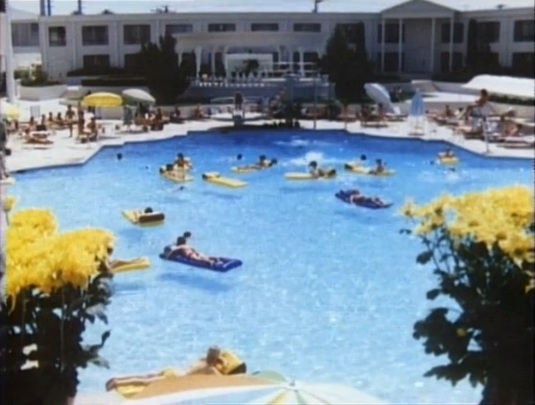 Requisite pool shot…very similar to shots from ‘Vega$’ and ‘Where It’s At’. Pool shot with the Palace Court in the background…this looks a lot like the present day Rao’s space. Notice the Roman scroll railing on the right. Neat! This is the first time we see Victoria’s face in the movie. 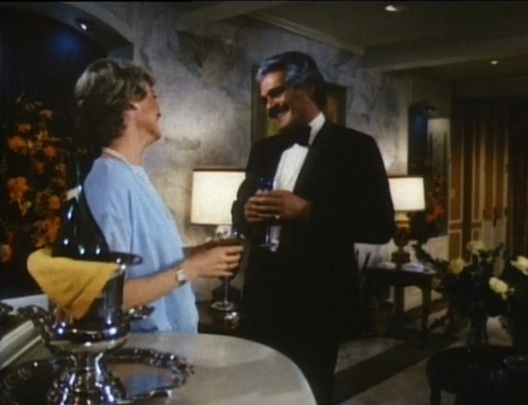 This would’ve been a big reveal since she was at the height of her ‘Dallas’ fame when this movie aired. 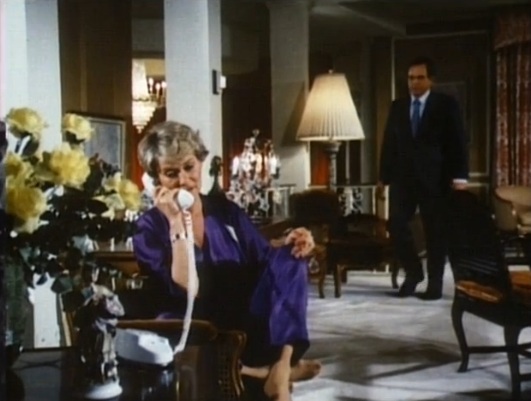 Victoria in her mini-suite. 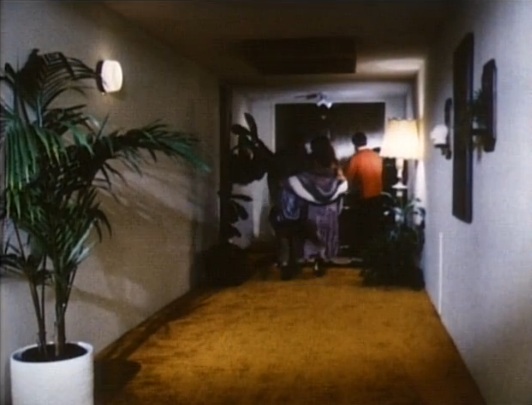 Cute, very 70s room. 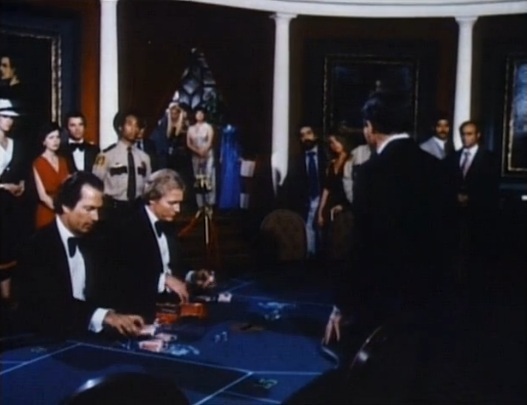 One last shot of Victoria gambling. Can you tell I’m a fan? 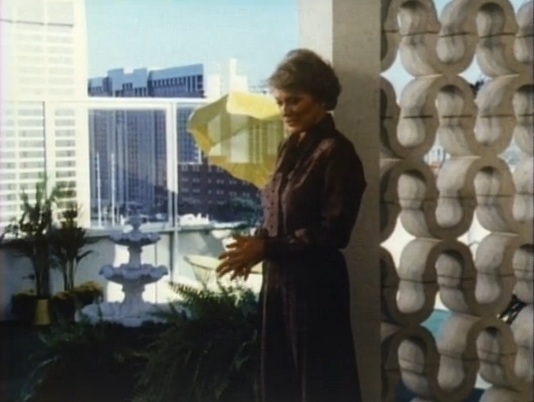 One of the best shots I’ve seen of how transparent the wire facade was. It’s hard to tell in most shots, esp. the night shots where it’s lit up. 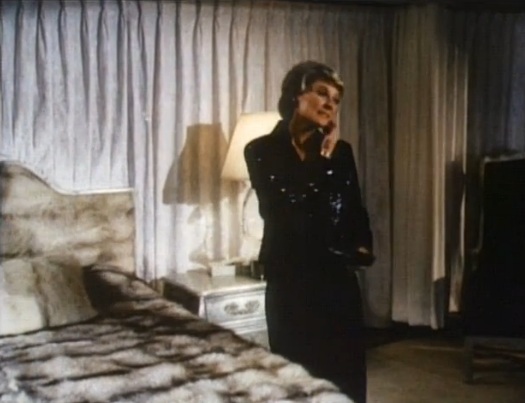 I wonder if Hope Lange’s fur bedspread and headboard were also by Mannis. 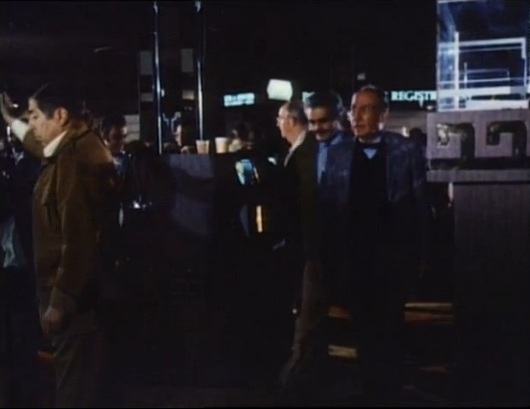 My apologies for the poor quality of the shots, but as I told a friend, this $1.99 digital copy of the movie on Amazon was literally like watching a worn-out VHS tape. 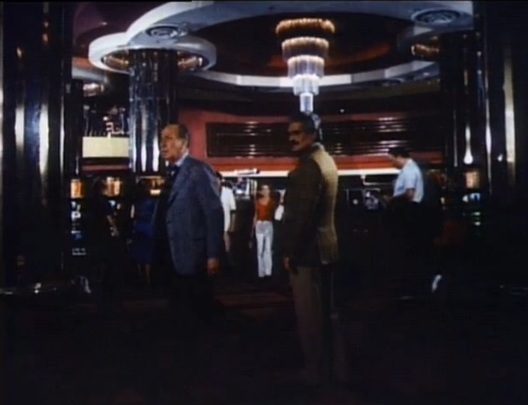 I’m just glad I found it (and now supposedly own the digital copy), as I’d seen it several years back before I knew as much about the layout of Caesars as I do now. 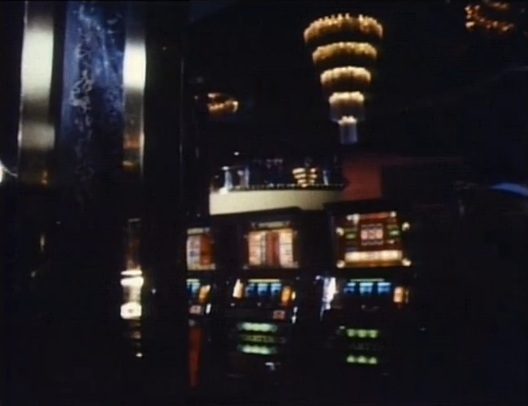 As I’ve said before, screenshots are an unappreciated form of photography, especially as far as casinos of the past are concerned (since photography wasn’t allowed on the gaming floor back then). 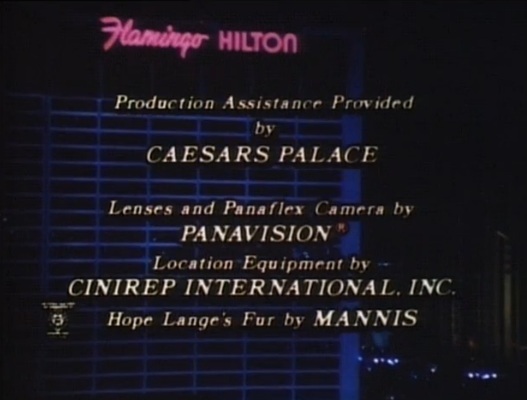 It’s been my pleasure to get these shots of the Pleasure Palace, AKA Caesars Palace, to share for posterity’s sake. If you enjoyed them, please share the blog link! 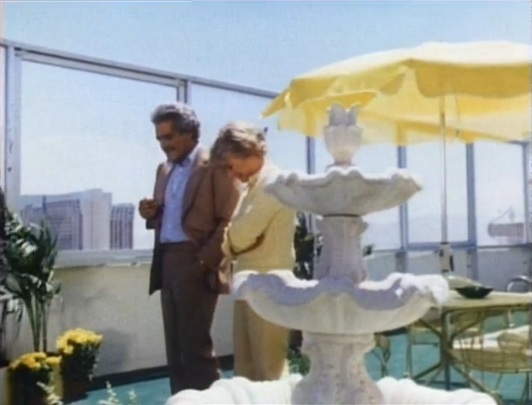 I have a VHS copy of this film, the story goes that Omar Shariff who is terrific gambler in real life was paid $500,000 for this film when they made it (1979 or 1980). 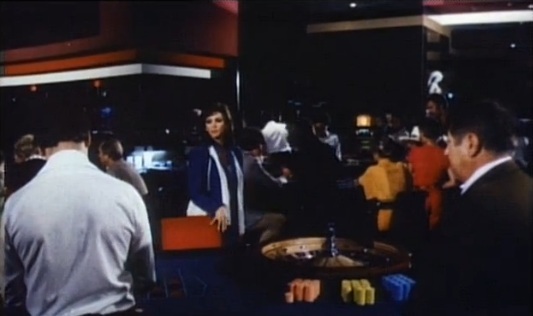 He was seen in between shots to be gambling non stop. 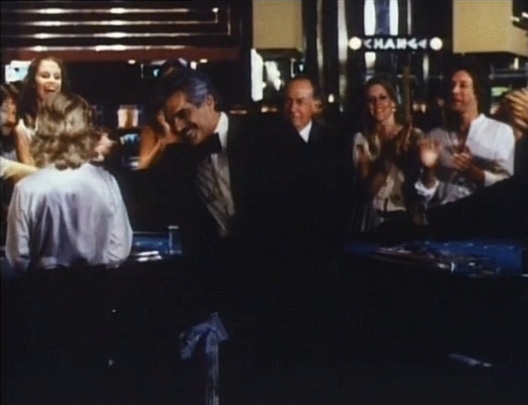 At the end of the film when he was paid, he admitted he basically turned the check over to Caesars Palace, he lost that much money during filming. 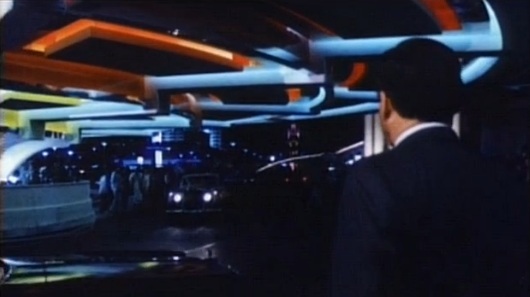 Some other points to mention, the futuristic entrance way was the base of the Omnimax theatre. The balcony bar was short lived and they turned it into a video arcade for children called at one point “Atari” with a sponsorship from them. 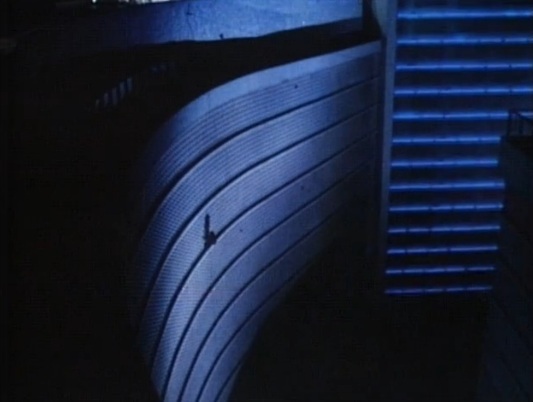 This was all wiped out when they decided to build the Colosseum theatre were Celine peforms now. 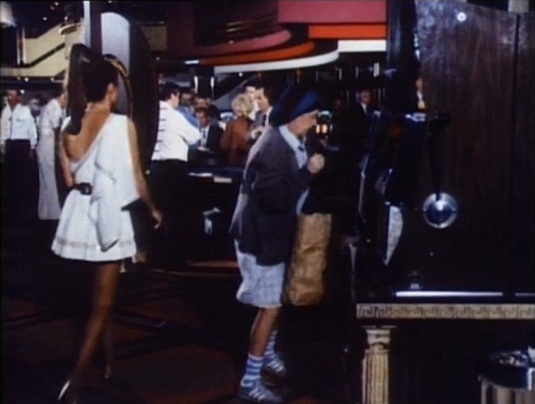 The change machine was actually a change booth, they didn’t have change machines back then. You took your bucket of coins to a person and they had the machine in that booth. Lastly, Palace Court sadly gone was an incredible experience. No restaurant today (including any in Wynn, Bellagio….etc.) matches that one, the staff was incredible, most were from Europe, all languages were spoken, true European class. You’re a fountain of knowledge, Phil! Are you a Vegas local, by chance? I actually found a vintage Palace Court matchbook the other day during one of my shopping sprees. Was going to try the current Empress Court just to check out the space, but have heard the service is horrific, which is inexcusable when one is paying that much for a meal. 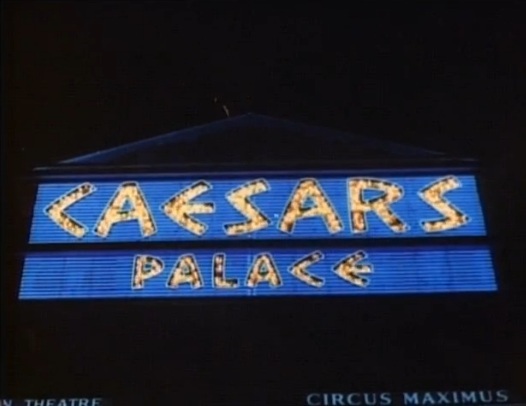 I’m very much a Caesars-phile…would love to know any other info you might know. E-mail me if you like: brt374@gmail.com. Thanks–Brian T.
Hi Brian, I guess you can call me a part-time local. I’ve had a place there since the 80’s, vacationed there since the late 60’s, but still primarily live out of state. Economy has unfortunately changed my retirement plans so my time there is not as much as I want it to be. 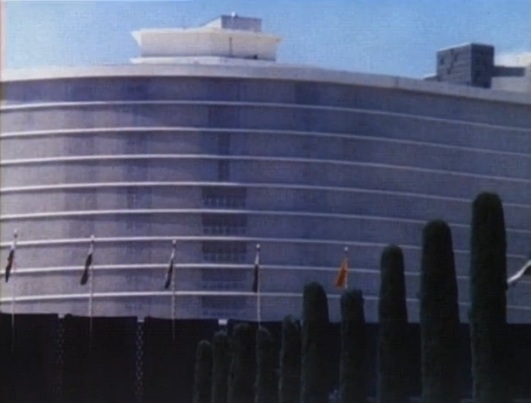 Anyway, Caesars has always been my favorite, the memories I have of that place unmatch any other hotel. In its heyday, it can easily be argued as the greatest hotel in the world. Through a multiple change of ownership some two decades ago, it rapidly started to downturn and because of that, it has become the mishmosh it is now. Its a shame, but its beyond going back at this point. I remember sitting in the lobby at Caesars, turning my head and Joe Dimaggio was sitting next to me (he was a regular at Caesars during his older years). 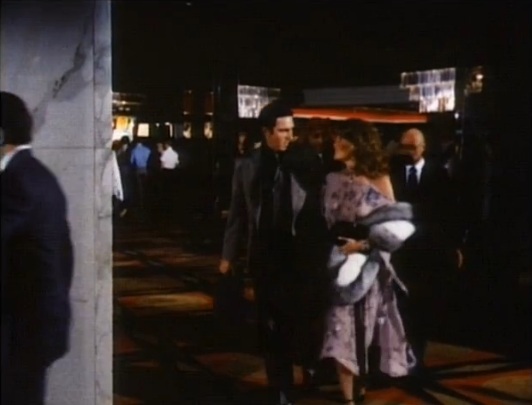 I remember sharing a conversation in the Caesars elevator with Tommy Hearns and Lou Duva. I remember getting a tennis lesson with their resident pro Pancho Gonzales, who was a tennis legend, and meeting a little boy with him whom he told me to watch out for in the future, that boy turned out to be Andre Agassi. I was at the pool in those photos and who was swimming in the pool but the legendary Tarzan screen star, Johnny Weissmuller who too was a employee of the hotel in his later years as a greeter. So many more memories, and this stuff happened everyday there. 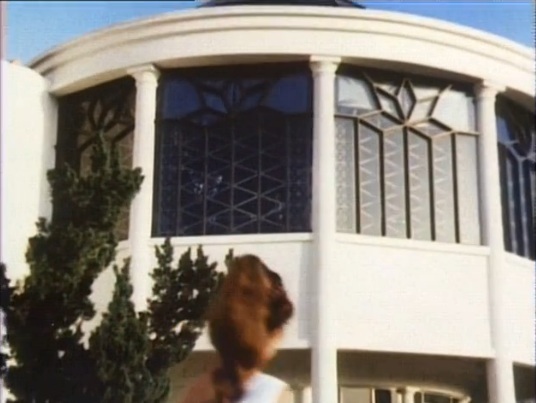 It was a special place and time, and things just converged to create the aura that place had. Everytime I go in there now, its a little sad. Still love it, because in a way I consider it “home”. What great memories, Phil! I have a small collection of Caesars collectibles and would love to pick your brain next time you’re in town. 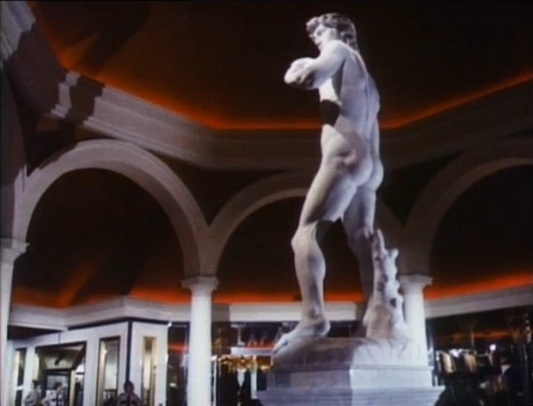 Please let me know…the Galleria Bar is still one of the best places in Vegas for people-watching. Ok. I have some stuff too that might surprise you, some perks of being a good customer of Caesars in its early years. I’ll try to send you a couple photos via email later this week when I have a chance to get it together. I think you’ll enjoy seeing some of these. Can’t wait, Phil. I have a Steve & Eydie menu from Circus Maximus, lots of matchbooks, a few postcards, and plenty of stuff from the last 10 years during which I’ve been a guest. Sounds like you have me beat…not that it’s a competition!